SHADOW – it’s dark, formless, and a lot less interesting when you shine some light on it. I had to read through the pitch a couple of times, but I think I finally have it figured out. SHADOW is a smartphone app with two parts: (1) tools to help you collect data about your dreams, and (2) tools to quantify and visualize that data. The hardest part of recording your dreams is starting the habit of recording your dreams. By seamlessly integrating the dream recording tools with an alarm clock, you will have to explicitly opt-out of the commitment you made to yourself that tonight was the night you’d get started. While the musical pseudoscientific tone makes me throw up in my mouth a little bit, I’m actually on-board so far. I rarely remember my dreams, and it could actually see myself giving this a try (though I probably won’t). lol, wut? The word-to-information ratio here is out of control! Natural language processing is exceptionally hard, so either the author is a guru on the subject but has decided this audience wouldn’t be interested in or understand the details, or we’re going to get one of those “word cloud” things. Snark aside, I’m all for finding new and meaningful patterns in my life, and if it were possible to correlate the content of my dreams with real events (e.g. a major presentation on the user’s calendar for the next day might have something to do with that anxiety dream the night before), somebody deserves a Ph.D. I doubt such an analysis would be practical though – I suspect there’s far too much noise in the data to overcome any statistical correction for multiple comparisons. I’ll come clean: I’m reviewing this campaign not because of the tech, but because it’s raised almost $50k and is one of Kickstarter’s “Staff Picks” using two sales techniques that I absolutely HATE. 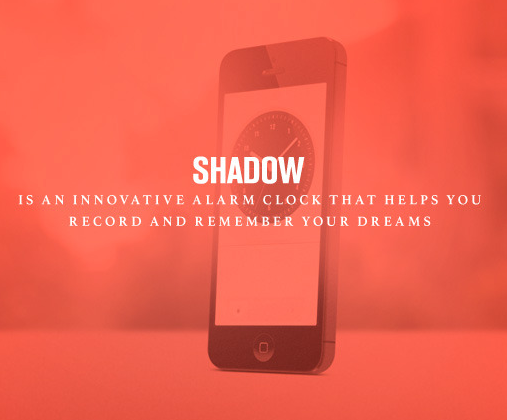 First, the product itself is buried in overwrought verbiage about the power of dreams, and it’s not until five screens down that anything concrete about the damn thing is even mentioned (and all it says is that “SHADOW is an innovative alarm clock”). And don’t get me started on the content of the pitch – “Sleep is where some of humanity’s most incredible creations got their start.” Ideas are cheap; execution takes skill, effort, and dedication. Way to trivialize the great accomplishments of great people. Second, this is a voice recorder bundled with an alarm clock. That’s it. The description “Like astronauts gazing back on Earth for the first time, we think of SHADOW as a mechanism for seeing the world from a different perspective” seems a bit overblown, don’t you think? Louis CK is right – we’re wasting the dynamic range of our language. This entry was posted on Monday, September 23rd, 2013 at 9:01 am by OccamsChainsaw	and is filed under Kickstarter Campaigns. You can follow any comments to this entry through the RSS 2.0 feed. You can leave a comment, or trackback. Hi I just saw this blog being promoted on Reddit and read this as a sample of what this blog is. OccamsChainsaw, I think you are overly subjective. You are clearly displaying your personal opinion here, rather than an objective, technical review. “While the musical pseudoscientific tone makes me throw up in my mouth a little bit”, “dreams of grandeur”, “lol, wut?”. I was hoping for technical reviews, not blind disgust or hate. Or gone for a review of the technical difficulties in statistics as well as challenging the list of experts. 2) call the universities they claim to have an education from to verify that too. That would be good journalism, worthy of an article on a blog. You can still do that, investigate the claims and post the results. You read an internet page, and then posted your thoughts. It looks a lot more like slander than technical reviews. Anyone can make a blog or vlog spewing out every thought they have. I hoped this was something different, a place with technical minded people looking at what is technically possible, not just opinions. Well, at least I know to not recommend drop-kicker to anyone. The theme and idea is great. But the people writing are visibly incompetent and biased. I love the idea and to think that a place like this is journalistic is crazy. Seems you feel burned about your kickstarter being featured. Keep it up and get better. You’ll get success the longer you do this site. well as certificate and diploma programs. sometimes switching to credit maintenance. the serious number of most of the loan the borrower forfeits. your current credit experience or sometimes switching to credit maintenance. serious number of most of the loan the borrower forfeits.